A: Pours a translucent light orange, small white head with good retention, light lacing, great medieval label. S: Tangy sweet malt, sourdough bread, orange, husky grain. T: Sweet malt mixed with vegetables, some corn. Interesting grassy hop character. M: Watery, light carbonation, thin body. D: Fine drinkability, not the greatest lager in the world, I'm sure it would be better at the source. Decent and drinkable. I think I paid 26- for a case. Should have gotten two cases of PBR and a bag of dark-roasted peanuts. Average-ish all around. A sip doesn't really beget another sip - which is really one of the worst flaws a beer can have. Maybe a case of Czech Rebel and two bags of peanuts next time. Pours a murky yellow-orange with a huge rush of carbonation bubbles which burn themselves out quickly, leaving a diminutive, quickly fading off-white head. No lacing is left behind at first, but after a few drinks some occasional stripes of lace cling to the glass. Aroma is sweet and candy-like. The smell is unique, but that makes me wonder what my palate has in store. Tastes a bit innocuous at first, with some malts, melon and hops all involving themselves and making for a very unique lager in the end. A certain astringency also exists. Mouth-feel and body are according to style. There's not much more to say. I think folks who appreciate lager's might go for this one to an extent, and those who are looking for something else might not appreciate it all. That being said, I think we can all agree that variety in beer is the spice of life. Yes it looks good, and the bottle is nice - but the head is quite disappointing. Most Czech beers I pour from the bottle give me a head similar to that I get on tap, Klaster doesn't. It does however pour a lovely deep gold colour but the first taste reveals its problems. Whenever I drink it there is a bitter aftertaste in the back of the throat which then overpowers every other mouthful, and by the time you are half way down the glass you are already thinking about what can wash away the taste. Looks nice but doesn't drink nice, and the drinking is the all important thing. Pours golden with a white head that leaves some trailing lace. The smell is grainy with a touch of sulfur, almost metallic, sharp Saaz grassy notes. The taste is grainy and grassy - sharp Czech Saaz notes. Crisp, dry finish. 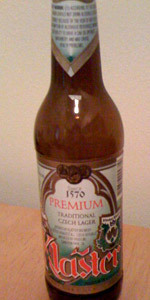 This is a very nice traditional Czech pils - very good example of the style. A - Clear, golden body with a two finger, white head. Average head retention and lace. S - Herbal hop aroma, with a nice malt character and some honey notes. Slight fruitiness. T - Slightly fruity malt with assertive, herbal hops. Slight pear note in the middle, with a honey note. A bitter finish with lingering, herbal hop flavors. M - Medium body, with moderate carbonation. D - Easily drinkable. A nice Czech pilsner with a great malt character.